In October 2012, Superstorm Sandy ravaged Hoboken, N.J., bringing floodwaters that damaged critical infrastructure and left 90 percent of the city without power for nearly two weeks. To avoid future catastrophes from another natural disaster, Mayor Dawn Zimmer began planning a self-contained microgrid for the city. In October 2012, Superstorm Sandy ravaged Hoboken, N.J., bringing floodwaters that damaged critical infrastructure and left 90 percent of the city without power for nearly two weeks. To avoid future catastrophes from another natural disaster, Mayor Dawn Zimmer began planning a self-contained microgrid for the city, with the aim of improving energy availability, reducing pressure on the main power grid during peak hours and increasing the use of renewable power sources. Funded in part by a technical assistance grant from the Department of Energy, the city tapped Sandia National Labs to begin the initial analysis for the microgrid project. The resulting analysis identified 55 buildings – including police stations, fire departments, pharmacies, senior facilities and low-income housing – that needed critical back-up power through a microgrid. To make the microgrid a reality, Hoboken hired Greener by Design, a private firm, as its energy consultant with Gail Lalla, senior project manager, taking the lead. Lalla had two primary challenges. First, she had to bring all the necessary stakeholders to the table, and second, she had to explain the benefits of a clean microgrid while making the case for the future cost efficiency of renewables in the face of up-front costs. 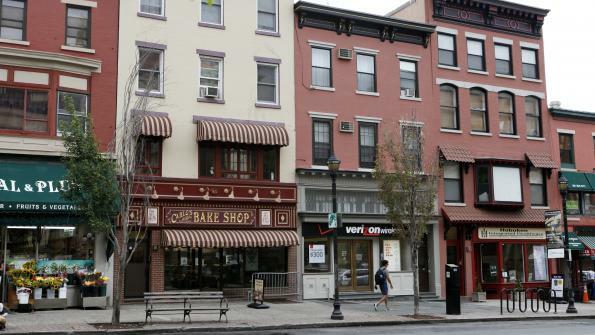 To achieve these two goals, Hoboken would need an organizational tool to ease the process. The Greener by Design team reached out to EDF Climate Corps, a program that embeds graduate students in organizations to accelerate clean energy projects, to create the organizational tool. The primary aim of the toolkit was to address Hoboken’s specific needs, but a secondary goal was to create a model that could scale and adapt to different types of buildings and different communities. A centralized dashboard allows all participants to share knowledge among one another on issues like energy consumption and greenhouse gas emissions per building, the use of renewables, and costs year over year. This can facilitate formal greenhouse gas reporting and ensure that buildings are not using more energy than necessary. A customizable timeline is included in the toolkit because microgrid projects can be complex and take several years to implement from research to installation. With this adjustable, milestone-based timeline, toolkit users will be able to track these long-term projects easily and inform all of the stakeholders from the start. A scorecard allows users to measure the benefits, including environmental, financial and social benefits, and view them graphically. The scorecard also allows users to compare one microgrid to another, making the toolkit useful not only to Hoboken, but to microgrid operators anywhere. With the Resilient Microgrids Toolkit complete, Hoboken plans to begin installation of its microgrid in the summer of 2016. But Hoboken is not the only city that can benefit from a clean microgrid, as city managers all along the East Coast have been looking for ways to improve the resiliency of their infrastructures. According to the National Oceanic and Atmospheric Administration’s most recent research, 39 percent of the U.S. population lives along the coast, making the Resilient Mircrogrids Toolkit a much needed resource. To enable this, there are plans in the works to create a dynamic web-based toolkit with a user-friendly interface. A major part of this will be a way for experts to share experiences and expertise through an online discussion forum. Since microgrid projects require in-depth knowledge on a variety of topics, it’s important that experts share their thoughts on everything from city planning and project management, to legislative process and policy, to stakeholder engagement, finance and environmental sustainability. Communities learning from one another – with the benefit of a thoroughly vetted toolkit – is perhaps the best way to proliferate clean, resilient microgrids. Devashree Ghosh is a graduate of The New School’s Milano School of International Affairs, Management, and Urban Policy, and is an EDF Climate Corps alumnae.